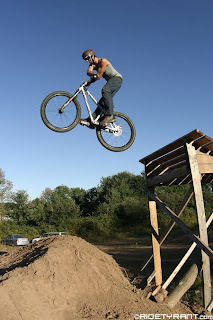 It's on boys and girls...Blachura's B-Day Dirt Jump Jam is this Sunday from 2-dark at The Lot. It's going to rain like hell Saturday, but we're not scared...the tarps are ready to be laid out. Bryan and Dave are working to get the place mint by the weekend. It's gonna be bonkers!!! Don't forget to bring some spending money...pizza, TYRANT shirts, and Belltown Skatepark T-shirts for sale!